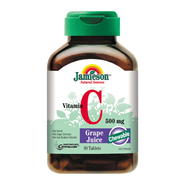 You won't find a better tasting Chewable Vitamin C product, with natural grape juice. Boosts your immune system and helps eliminate toxins and germs from your body. As an added benefit, Vitamin C helps speed tissue healing and maintains strong teeth, bones and gums. One 500mg tablet is all you need to get your daily requirement of this vitamin basic. Each tablet contains: Vitamin C 500mg (ascorbic acid, sodium ascorbate). Prepared in a specially formulated nutrient base of natural fruit pulp extracts, acerola, rosehips and the complete vitamin C complex of rutin, hesperidin and citrus bioflavonoids. Sweetened with Mannitol and Crystallose.